The 2012 Mets have had a remarkable run of six-consecutive weeks in the imaginary playoffs. Among the many quirky, lovable gentlemen in the team’s clubhouse is Mike Baxter, a Whitestone, Queens, kid who grew up rooting for New York’s National League club. Yes, Baxter has hit the big time, but he’s still not immune to New York City traffic. “I left the house at 1:15 with the hopes of getting to the field like I normally do, at 1:30,” he told The Sports Section yesterday during his epic hour-and-a-half-plus drive from Long Island City to Citi Field. 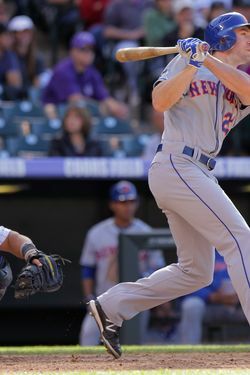 “It’s 2:42, and I’m, like, seven minutes away.” Baxter did eventually make it to the park, and his double was one of few bright spots in the Mets’ 8–0 loss to the Brewers. He graciously took a moment while battling through gridlock to talk about the squad’s start and what it’s like to live every young fan’s dream of playing for the home team. Were there any players who you used to pretend to be in your backyard that you still try to emulate? I would say John Olerud was my favorite hitter to watch and emulate. [I would] replicate his swing and pretty much the whole way he went about playing the game. I always admired it. He played hard and had guts. He was somebody that I wanted to try to grow up to be like. Do you think there’s something about this year’s team that’s consistent with the historical character of the Mets’ franchise, considering that preseason expectations weren’t very high and you’ve had so many comeback wins? I’ve always seen the Mets as a gritty group. As a kid, as a fan, I think that’s what drew me to the Mets. They were always a team that fought, a team that people could relate to as New Yorkers, and that’s what I liked about them. And that’s what makes playing on this team great: We come out and try to fight every day. Regardless of what was talked about in spring training, regardless of what the preseason perception of us was, we knew we had a bunch of good players, and we’re just going to try to continue to play a good style of baseball — good, quality, fundamental baseball — and try to prepare to play hard every night. In the World Series, David Freese was a huge story as the hero for his hometown team. Did you watch that? And did you think, I want that to be me next? Oh, David. The funny thing about that question is David and I were teammates in the San Diego organization in like 2006 and 2007. We came up in A-ball together. So I was watching that game on multiple levels; obviously, it was the World Series, but I was also rooting for David. So watching him have that magical World Series run, it was really great, and I felt so happy for him. I enjoy playing in New York, but what David did in St. Louis was really incredible. Should we mark our calendars for October to see you do the same thing? [Laughs.] We need to keep playing good baseball. How about that? I’ll try to do my best in whatever role [I have]. We’re going to try to beat the Brewers tonight. That’s the best way to answer that question. Do you think anything could happen now that you’re on the Mets that would change your emotional attachment to the franchise and the feelings you came in with? No, I don’t think so. You grow up and root for a team and everything, [but] as a baseball player you realize there’s this aspect of it … I’m just grateful to have an opportunity to be playing. Even more so, I was so lucky to get brought back to New York, which is a once-in-a-lifetime thing. I’m trying to really enjoy it as much as I can while it’s happening. I understand that you never know how the game’s going to turn out for you personally. So, regardless of how it goes, I’ll always have a special place in my heart for the Mets as a fan and as a player. You know, I love this organization, and I’m very grateful that they gave me a chance last year after an injury. [They] gave me a second chance in the major leagues, and I’ll forever be grateful for that.